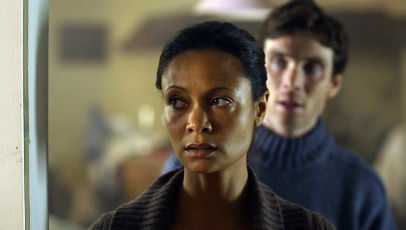 Martin (Cillian Murphy) and Kate (Thandie Newton), a couple from London, escape their broken marriage to an isolated island named Blackholme, which they visited as young lovers. While at the retreat, the couple attempt to put their past troubles behind them, only for their lives to be thrown into jeopardy when mysterious stranger, Jack (Jamie Bell), winds up on the porch. Caked in blood, Jack claims to be an ex-soldier escaping a deadly virus that’s sweeping the globe and and tells them that they must do everything in their power to protect themselves. Taking a familiar concept and moulding it in their own rascally way, Tibbett and co-writer Janice Hallett are able to sculpt an engaging, thought-provoking and unnerving three-hander. Particularly for the first half, Retreat unfolds as an aptly taut, intimate thriller, playing to its strengths and retaining full focus on Martin and Kate as the nightmarish scenario rocks them to the core. Disappointingly, however, towards its final act it forces itself ahead too quickly and endorses a few too many horror contrivances for its own good, resulting in an ending that feels somewhat unsuited to the meditative narrative that came before. These, however, are minor issues and tolerable considering their writing inexperience. Like his writing style, Tibbett’s direction is evidently a work-in-progress. But, from what’s on display, it represents an up-and-coming talent who, with the right source material and level of control, could take the cinematic world by storm. His use of penetrating camera angles, tenebrous lighting and tactical use of IIan Eshkeri’s enervating score all contribute to the sinister tone surrounding the unpredictable proceedings. Perhaps its biggest strength comes in the form of its adept cast. Newton and Murphy deliver convincing performances as the emotionally plagued couple, in spite of their underwritten personas and apprehensive chemistry. Meanwhile, Bell assumes authority as the cryptic Jack, himself unsure of his intentions, but nevertheless merciless in his wicked demeanour. Through a skilled cast, gutsy direction and unnerving unpredictability, Tibbetts, despite a carelessly enforced midway shift, has fashioned an admirable directorial debut in Retreat.